The spectacular music that featured throughout the London 2012 Olympic Games Opening Ceremony is available digitally now, around the world, just moments after the Ceremony has ended. 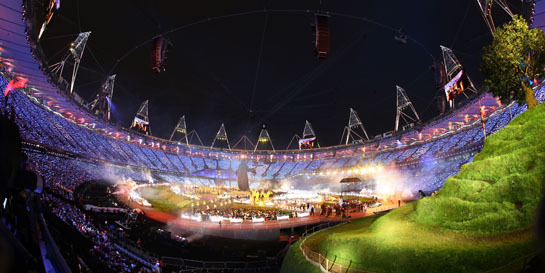 From the moment the specially-commissioned 23-ton bell, the largest harmonically tuned bell in the world, chimed, the Olympic Stadium came to life with music. The emotional punch and strength of two brand new compositions from Underworld provided some of the most stirring moments of the night. From the majestic beauty of the London Symphony Orchestra performing Elgar’s ‘Nimrod’ and Vangelis’ ‘Chariots Of Fire’ to performances from Mike Oldfield, Dame Evelyn Glennie, Arctic Monkeys, Dizzee Rascal and Emile Sandé, the entire Opening Ceremony celebrated the global impact of British music. The stunning Ceremony, directed by Danny Boyle, was hailed as a triumph for Music Director Rick Smith, of the electronic duo Underworld. Smith composed two original pieces of music for the Ceremony as well as producing all the music elements of the three-hour extravaganza. The two new Underworld compositions were the pounding ‘And I Will Kiss’, which accompanied the industrial revolution ‘Pandemonium’ sequence, lasting 17 minutes, and the elegiac ‘Calibans Dream’ heralding the arrival of the Olympic Torch in the stadium. The Opening Ceremony also featured performances from Emeli Sandé with a unique rendition of ‘Abide With Me’, Dizzee Rascal performing ‘Bonkers’, Arctic Monkeys with ‘I Bet You Look Good On The Dancefloor’ and a cover of The Beatles ‘Come Together’ and an inspired accompaniment to the army of NHS nurses and children from Great Ormond Street Hospital by Mike Oldfield. His live reworking of the classic ‘Tubular Bells’ and ‘In Dulci Jubilo’ - also his first live UK performance in 13 years - was yet another uniquely British showstopper. 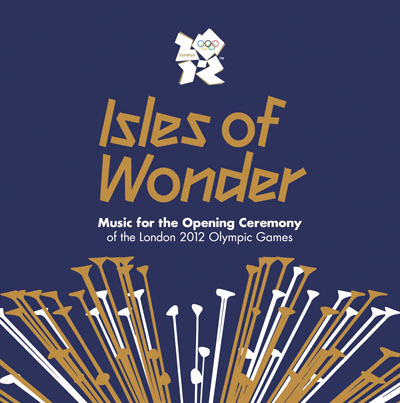 Danny Boyle, Artistic Director of the London 2012 Olympic Games Opening Ceremony, revealed in January that the Ceremony theme had been inspired by The Tempest’s ‘Isles of Wonder’ speech – from which the title of the album has been taken, and will star a cast of more than 10,000 performers. In December 2011 it was announced that LOCOG had appointed Underworld, the British electronic music duo, as Music Directors of the Olympic Games Opening Ceremony. Underworld’s Rick Smith and Karl Hyde had previously worked with film-maker Danny Boyle on film soundtracks such as ‘Trainspotting’, ‘The Beach’ and ‘Sunshine’, and most recently on the Olivier-nominated music for ‘Frankenstein’ at the National Theatre. The Olympic Games is regarded as the world’s foremost sports competition where more than 200 nations participate. The celebration of the Games encompasses many protocols, symbols, such as the Olympic Flag and Flame, as well as the Opening and Closing Ceremonies. As the Host City, London has showcased itself to the world, with an estimated viewing audience of up to 1 billion people. The album is released by Decca Records and Universal Music Catalogue who are part of Universal Music, the official music licensee for the London 2012 Olympic Games with the support of The London Organising Committee of the Olympic Games and Paralympic Games (LOCOG). ‘Isles of Wonder - Music For The Opening Ceremony of the London 2012 Olympic Games’ is released immediately, on the world’s foremost download and streaming platforms, prior to the physical release on August 2.